Do you have an iPhone that won’t ring? There’s no ringer and alerts. Your ringer volume is set to the max. However, your iPhone doesn’t ring at all. In this article, we discuss how to fix “iPhone not ringing” problems. Help! My iPhone won’t ring! I tried everything! Why won’t my iPhone ring? Firstly, calm down and check the ringer switch on the side of your iPhone. An image of the various iPhone buttons and their functions. Firstly, look at the left side of your iPhone. 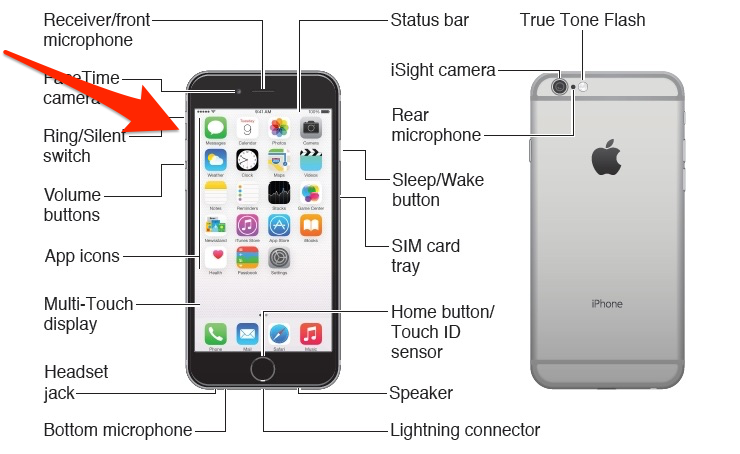 There’s a small switch on the upper side of the iPhone. Is the switch pushed down toward the back of the phone? If it is, you see an orange strip. If yes, then your iPhone is in silent mode. Now, slide the switch up toward the screen. This disables silent mode. Finally, test to see if your iPhone rings. If you iPhone does not ring after the above, then continue with the guide for more help. Do not disturb mutes all notification sounds on your iPhone. This includes incoming calls and text messages. Then, tap Do Not Disturb. Finally, tap the toggle to turn it off or on. Firstly, slide up from the bottom of your iPhone’s display. Finally, tap the moon icon to enable or disable Do Not Disturb. Then, tap Sounds & Haptics. Now, use your finger to move the slider all the way to the right to turn your ringer volume up. However, to use the volume buttons on the left side of your iPhone to turn up the ringer volume, make sure the switch next you Change with Buttons is turned on. You may use the buttons on the side of your iPhone to increase the volume or decrease the volume of the ringer and multimedia such as videos and music. iPhone Won’t Ring After Trying All Fixes? If your ringer still does not work, then, be sure to read How To Fix An iPhone That’s Stuck In Headphone Mode. This too can interfere with your iPhone’s ringer settings. However, if nothing works, and your iPhone still does not ring, be sure to contact Apple Support. Finally, check out the video guide below. 3D Touch Technology: What Is It? How To Use It?